Sonny's Racing Engine's has come up with a new "Lightweight Billet Aluminum" Valve Cover for all Sonny's 5.3 inch Bore Space Hemispherical Headed Cylinder Heads. These Engraved Billet Valve Covers are built for perfomance, and looks. These stylish covers won't crack like the old style sheetmetal covers, and they have great sealing surface area, for an increase in engine vacuum. These are a must for all out performance ! 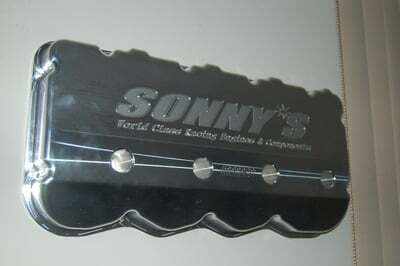 Call Sonny's to place your order today.